By: Shawn C Baker on 16/03/2013. It’s been approximately a year and a half since DC launched the New 52 and Scott Snyder and Yanick Paquette took on the daunting task of reinventing Swamp Thing. This week that run ended with its 18th issue. I’ve got to tell you, I’ve become quite a fan of Mr. Snyder’s, all largely due to this particular book. I missed the boat on American Vampire – as good as I kept hearing it was upon initial release I’ve suffered from Vampire burnout for the last few years and just have no interest in the fictional species. I missed the boat on his Batman revamp too, however when I tried to remedy that I found that I really didn’t care for it at all. No, with Snyder it was Swamp Thing and a little book called Severed - which is phenomenal – that made me a fan. Now, I was as skeptical as any other fan of Alan Moore’s inimitable run on Swamp Thing back in the 80’s being ‘messed with’. I don’t want to insult any of the other creators who have helmed the on-again-off-again Swamp Thing legacy over the years since Moore, but to me I (as I’m sure to many other fans) just the very idea of someone else writing the character is neigh unthinkable, so I’ve ignored every iteration of the book since. To me it is the equivalent of someone beside Grant Morrison writing Doom Patrol – I’m just not interested. However, the same friend who recommended Severed pushed Swamp Thing on me so vehemently that I began to cave. Couple this with the fact that upon its launching I was curious to see if the New 52 had anything to offer me, so I finally I very skeptically picked up the first two issues of the book and surprise – it wasn’t Alan Moore’s dark and brooding masterpiece, but it wasn’t too bad. I suppose it helped that it’d been a while since I’d revisited Moore/Bissette and Totleben’s Swamp and thus I had the appropriate distance to entertain the idea of something new. And though Snyder and artist Yanick Paquette definitely drew from the horrific vibe Moore and his crew so painstakingly crafted for ol’ Swampy they also tweaked that horror to align it with the more contemporary and sophisticated ethos of ‘darker’ superhero books. To do this it helped that the New 52 had set aside a little niche for their darker characters – concurrent books such as Demon Knights, Justice League Dark and Animal Man all were under the same editorial umbrella and written to occupy the same Vertigo-lite corner of the New 52. Of course what this was, we now know, was DC bringing all of their actual company-owned characters out of Vertigo’s hands. Fine, that’s something entirely different. 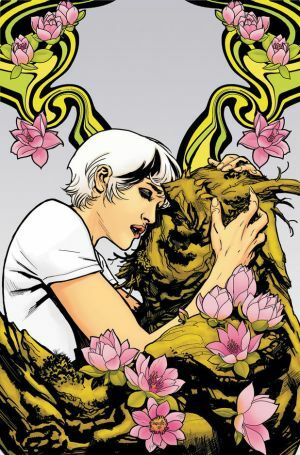 The New 52 and a book like Swamp Thing especially seemed to thrive on pushing the limits of acceptable maturity in the context of their new Universe and as I continued to read I felt that although the character in an entirely new light from what I’d seen, the book was good at what it was doing. And the art was INCREDIBLE. So month by month Swamp Thing became better and better. A large part of it was definitely Yanick Paquette’s amazing art – art that wasn’t just contained to what was inside the frames and borders of the typical comic book page. 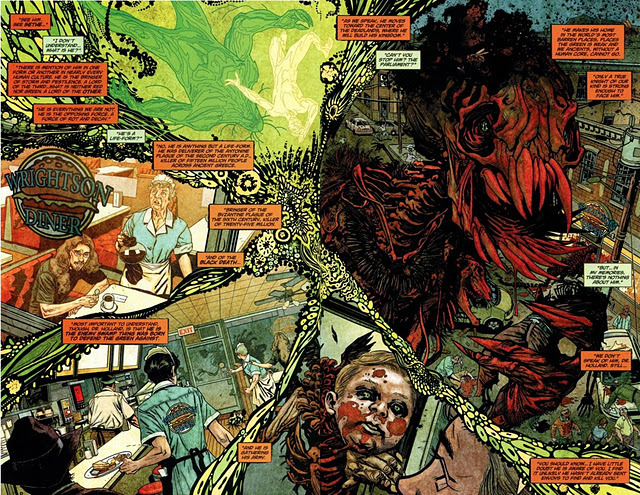 No, Paquette’s art often transcends and incorporates the layout of the pages themselves (think JH Williams III) and this very much fit with the lilting, halucinogenic feel and terror-mechanics of the book that saw Alec Holland return as the Earthbound avatar of the Swamp – now a part of what is called The Green in the New 52, one of several primordial and fundamental ingredients of the Universe itself. Of course in the primordial tradition of duality the Green has a direct antithesis, known as the Rot, and who better to be the Rot’s avatar than Swamp Thing’s own long time nemesis Anton Arcane? These are the basic elements that Mr. Snyder uses to set up the revamped saga of the Swamp Thing in the New 52. Of course Arcane’s neice Abigail – now daughter – Alec Holland and Swamp Thing’s long time love interest is present as well, which complicates things nicely as her blood makes her heir to Arcane’s evil legacy despite the fact that she is at heart a good person and not interested at all in playing any side of this eternal struggle – until she is actively involved by her family’s machinations (Abigail’s brother William is especially frightful and well-written in this version of the saga – a homicidal little pre-teen who runs around in a gas mask and can turn the dead tissue in an organism against it). Needless to say, things get messy, for the characters and the book. The picture of Arcane embedded above, with his skinless visage and bloodied knife sums up exactly what originally made this book so strong for me – a gutteral return to that grainy 70’s horror comic feel wrapped in the crescendoing pace of a fantasty-based superhero franchise. This worked for a while – probably just over half of Snyder’s run. Then came the crossover, Rot World. Or more specifically, then came Prelude to Rot, Rot World: The Green Kingdom and finally Rot World: War of the Rot or Finale. That’s a lot of Rot World, eh? Now, as far as big company crossovers are concerned this one is fairly un-demanding in terms of additional books, and kudos for that. Swamp Thing really only directly crossed over with Animal Man, which was set out to be its sister book from the start. However, having a ‘prelude’ and the actual event occur in two separate iterations drew it out and caused the aforementioned crescendoing superhero pace to begin to stutter, removing the slow and often revelatory terror hiding in the nooks and crannies of this new world’s horror-strewn nightmares. This is the kind of pacing for a crossover I associate with those 90’s Scott Lobdell/ Fabian Nicieza X-book events and that is not a good thing. To build for 98% of the event and then have a quick fix ending is anything but satisfying. It wasn’t all bad, and there were moments that shone, but Swamp Thing very quickly went from being the second book I read when I brought it home (depending on what else was I’d picked up that week) to something that floundered on the pile for often an entire month. For my tastes the entire concept of Rot World was too big to work within the scope of this little corner of the Universe. The idea that Animal Man and Swamp Thing end up in a future where Arcane has destroyed the world with The Rot, converting everyone and everything – including many heroes – save for a few of the characters who had a connection to The Red or the Green into homicidal, slavering monsters plays out like a third-rate XMen: Days of Futures Past. Sadly, near the end of his run, Scott Snyder had lost me. Then a funny thing happened this last Wednesday. I made it to the shop and picked up my books. I’d known Snyder’s run was ending and had planned to read it until the end, however I’d pretty much forgotten when that event was scheduled for. However when I looked through my new books for the week I could tell right away from the cover of Swamp Thing #18 that it was the finale. I made it a point to go home and finally read the previous issue, then steamrolled right into the climax. Okay, maybe tyrants is a little strong, but really, this is the second book that I personally grew disinterested in reading due to what felt like an editorial push-pull with the writer (the other was Justic League Dark) and about the fifth or sixth that I’ve heard about having the same problem through second hand discussion with friends. But that’s a soapbox I’ve already yelled raw here, so enough. Regardless of the flaws and their causes, Snyder and Paquette’s Swamp Thing, while not the same night-terror that Moore, Bissette and Totleben created in the early 80’s, was a pretty cool ride. The art alone is worth the price of the book, and the way the two creators wove archetypal horror imagery into the skinned cacoon of what is essentially a superhero book was gripping and bloody good fun (really!) at best and probably still a cut above most of the other New52 titles at worst. Now, time to go re-read those old Alan Moore issues!! !